Thank God for seeing us through another week. It's so good to be reminded on every Thursday to count my blessings and remember to give thanks and praise to God. ♥ Thank you for your prayers for the 83 years old elderly lady, TAM, whom I shared about on my last 2 TT posts. She has been attending my church's evening services whenever she can. She has severe heart failure and may go any time. Some sisters-in-Christ and myself have been visiting her and sharing God's Words and love with her. She has been having some relationship problems with her children who do not know the Lord and do not care for her as much as they should. Last week she was suicidal as her son has been causing her much problems and scolding her very badly. She was deeply grieved. Thank God that a Social Worker went down to visit her and managed to help her worked out some solutions to her various problems. The Social Worker will be meeting up with her children to counsel them as well. Thank God that TAM is feeling so much better now. I just visited her yesterday. She is thankful to God for working things out for her. She is still grieved by her family situations but she is learning to cast her cares upon our Lord. It is heartening to hear her thanking our Lord and knowing sensibly that our Lord has protected her and provided for her. May she continue to cast all her cares upon our Lord and find peace and rest in Him. 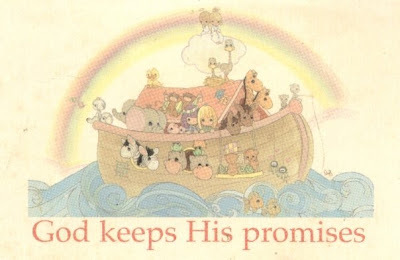 ♥ I am thankful to God that He takes care of us daily and provide for our every need. I am thankful especially that He takes care of the Widows like TAM and the Fatherless and provide for their every need. Even if their family members do not take care of them or even forsake them, God is able to provide for them. I am reminded of the way God took care of the widow in 1 King 17. This is my encouragement as I continue to serve our Lord among the poor and needy widows that come to my church's evening services. With God all things are possible! 10So he arose and went to Zarephath. And when he came to the gate of the city, behold, the widow woman was there gathering of sticks: and he called to her, and said, Fetch me, I pray thee, a little water in a vessel, that I may drink. 11And as she was going to fetch it, he called to her, and said, Bring me, I pray thee, a morsel of bread in thine hand. ♥ I thank God for my family, my church, my friends and everyone of you, my dear blogging friends, and for your prayers and encouragements. They mean a lot to me.You have made a great difference in my life by your friendship and encouragements. I thank God for every one of you. May God may your visit here a blessed one too! To read more Thankful Thursday visit Iris. Nancie, You have so much to praise God for this week! 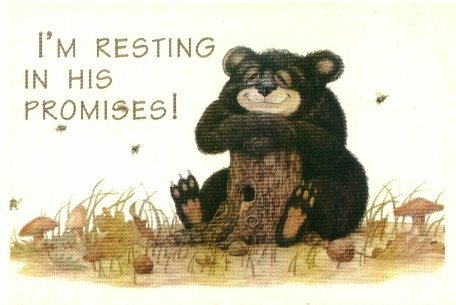 Keep resting on His promises.... aw, what a cute bear! Thank you so much for this post! I mentioned being thankful for God's promises in my post, too. I am praying for you and for your friend! Prayers continue for dear Tam, and asking God to pour His love and strength all over your life. I love you. Indeed, God provides! He is my ROCK!! Thanking God with you for providing for your widow friend! Let Him be your strength! "I am thankful to God that He takes care of us daily and provide for our every need. I am thankful especially that He takes care of the Widows like TAM and the Fatherless and provide for their every need. Even if their family members do not take care of them or even forsake them, God is able to provide for them." We all need this reminder from time to time. Such a blessing when we receive it! I will continue to pray for TAM. Hi Nancie! I understand your weariness this week as I am tired too from the work I have been doing for VBS. But as I told one art friend, I feel I need to do the Lord's work 1st before art. You will surely be blessed for your helping TAM. Thanks again for your sweet comments to me esp the one from last week. Hang in there but please don't over-do. Take good care of you. Remember to be gentle with yourself. Thanks for your visit and encouragement. I love what you said on your blog about "I am thankful that no matter Where I am... How I feel... or what is going on at the moment... He is right there with me, beside me, in front of me, behind me, IN me..."
Amen! It is such a great comfort and encouragement that our Lord is with us always no matter what we go through. Thanks for sharing with us. Take care. You have very lovely girls! Thank God for giving them to you and endowing them with such sweet spiritual gifts. May they continue to grow up to be women after God's own heart. The prayer is so beautiful. Thanks for sharing with us. Take care! Thanks for your visit and prayers. I enjoyed your thankful list. Your little granddaughter is such a sweetie :) The pictures are so beautiful. Thanks for sharing with us. Take care! Thanks for your prayers and encouragements. I am encouraged by your post. "What does He give me? Peace that flows into my life daily like a river, joy, joy, joy, provision for my daily needs, gentle loving care that only He can provide, physical attention better than any human doctor, smiles and much laughter, which is very good and healing for my soul, companionship, He is my dearest friend. I could go on and on listing all of the things He gives to me. What does He take away? He takes away my sorrows, my hurts, my sadness, my pain, my worries, my stress, my doubts, my loneliness, my physical ailments, my insecurities, my fears, and those deep down aches that dwell in my heart. He refreshes, renews, and replenishes me. I will forever say, blessed be His name, His glorious name." Amen! God cares in so many wonderful ways. You are so precious to Him. I love you too. Take care! I love the flower you posted on your post. The flowers are so beautiful! I love flowers too and they always bring sunshine into my life. The Lord is my Rock too! Glad that Don is spending wonderful time with his sisters. May God continue to bless you and family. Take care and have a blessed weekend! May our Lord continue to restore your hip. Praying for you. Thank God for blessing you in so many wonderful ways. It is really encouraging to read yours and the other ladies' thankful posts. They always lift up my spirit. Thank God that we can encourage one another and give praise to Him through technology! Always amazes me :) Praise Him! Hope you have a very blessed and refreshing weekend at Okinawa. Take care! Thanks for your prayers for TAM. I am praying for you too. May God strengthen you daily. Thank God for His Words and the freedom of worship. Such blessings from God. Take care and have a blessed weekend! Thanks for your visit and encouragements. It is always so nice to hear from you. I need to try harder to pace myself and be gentle with myself. Praying for you. Do be gentle with yourself too. It has been really busy time for both of us. Thank God for giving us strength! Take care and have a blessed weekend! Praise the Lord for His care for us and for widows and orphans! He is using you and the other sisters in Christ. I'm praying. I love your sweet, thankful heart. You are a dear prayer warrior, and such an encouragement to me always! I love this sweet picture of the bear--that is what I need to do, just rest in the Lord! Hello dearest friend. I know I am late to visit on this post but here I am! I will keep praying for you and yours! And, hey, you are SO loved! Huggles! Thanks for your visit and encouragements. You are such an encouragement to me too. Congrats on your receiving a first place award in the beginners' level for your writing. I can sense your joy and excitement :) You do have a passion for writing and you are gifted in it. Thanks for sharing with us the site of Faith Writers (http://www.faithwriters.com/). I will hope to check it out later! Take care and have a blessed week! Thanks for your visit, encouragements and prayers. I am keeping you and yours in prayers too. Thanks for sharing those lovely photos of E.J. What a sweetie E.J. :) He reminds me of sweet Katie. Thank God for giving him to you and bringing such joy and comfort to Jack and you. I love the ways he naps, so cute :) Take care and have a blessed week!